Looks like there would be room for a couple of cannons Mr. Grymm . You two have some sense of imagination. She was carrying the name Enterprise when she fell into my hands last year. She has been re-fitted and will sail this year as Nefarious Enterprise. She be a speedy 24 footer but rather long in the tooth and sails out of Rheault Bay (near Kenora, Ontario) - freshwater pirates be we . If I can find a crew, she'll sail against the merchant ships on Lake of the Woods. She may not be wood and sail but she be a REAL pirate ship! I guess mine would have to be "Listing to Port"
Me dream ship be a triple masted Bermuda Sloop, an' her name would be either The Crimson Sooner or The Sweet Marie. LMAO!!! Oh, I love it! So incredibly perfect. :) Gives a whole new meaning to "Star Trek: INSURRECTION"! Can ye just see Picard or Kirk all pirated out? Hmm... I wonder if Shatner would dress up like a pirate? Tis a fine vessel with a perfect name. The year that the Great Lakes Medieval Faire had a pirate themed year, where pirates were playing oppasite king Aurther, There was a pirate captain on cast name 'Captain Tiberious Dirk' of the galleon 'Enterprise' and they have puns like that for characters' names every year. Cartoon was captioned: Captain James T. Kirk of the Enterprise. Oh, I love it! So incredibly perfect. :) ..... Tis a fine vessel with a perfect name. I really have to appreciate the Kirk puns. Our ship is and will always be The Jade Dragon. Sleek, fast and a growl to not challenge. 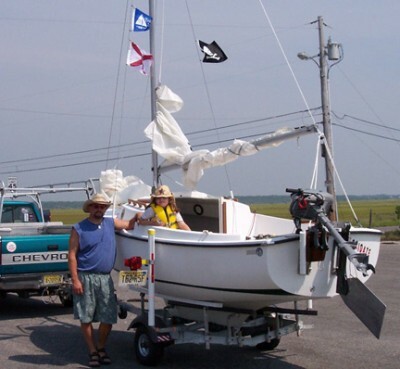 When the storyline for the BC Renfest began she was a sloop but since that time Charity has taken her Uncle's flagship and renamed it (Challenging the bad luck of renaming a ship) in order to make it hers. The Sussex Rose is no more and her revenge on her uncle is nearer completion. The Jade Dragon is now a Caravel and the original battered old sloop became a fireship. Now and then a bit more of Luna's past comes to light. this is part of a letter Scott, the gentleman we bought Luna from, sent me. We knew Luna was a form of his wifes maiden name of Moon, but this is so great to add. Also, this will appear in our next news letter which goes to print on monday with a guest article by the pubs very own Capt. Bo! I wanted to pass on a little info on why I named "Luna". Lt.
original name of "Privateer". As a tribute to Guy, I chose his surname. at the Veteran's Memorial Cemetary in Jax, Fl. , where Guy is buried . Well, my best friend and I are going to take a 28ft. pontoon he has been trying to get rid of for three years and disguise it as a small flatboat with cabin and a mast with a square rig, and a big rudder for the lake/river. Ought to be fun. We are mounting a 20 foot jon boat between the pontoons for cargo hold and extra bouyancy too. Shouldn't be able to see any of the aluminum when we get done with it. Using old barn wood and plywod to cover it with. We are calling it Le Farb. Tis is what we are going to try and accomplish. It will be on a pontoon base so we can trailer it easily. Edited April 24, 2011 by Capt. Bo of the WTF co. I'm going to build a rowing scow to go along with it. Period correct all the way back to 17th century, the design hasn't changed muck, and more useable for me here on the lakes and small rivers. My old gal is called The Lola. 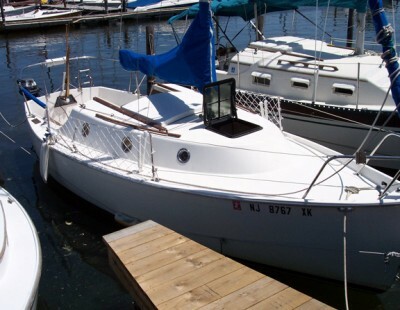 My first sailboat, a 1976 Com-Pac 16 I bought off eBay. Named her Floridaze. 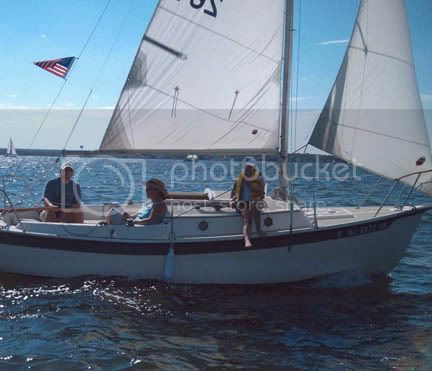 Since that time we moved up to a Com-Pac 19 called Gypsy Soul and now own a Seaward 22 named Panacea. 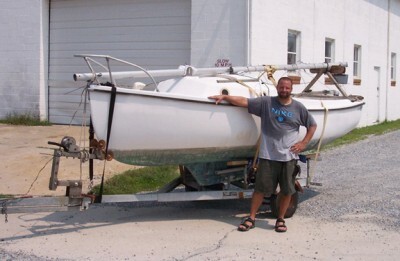 I sure miss that little 16, I was able to trailer sail that one. Pan has been on the hard the last two summers, no cash for a slip. "I know what one is but what is a 'panoe'?" Now that be a good question. If'n I had a ship, I'd call her the Bobbie Lou, fer Robert Louis Stevenson, o' course! And it'd be a full-fledg'd Pirate ship, dedicated to all good-hearted Buccaneers everywhere! And cheats both the noose an' perdition! Our ship is the Hellion, formerly HMS Hellion, but we had a disagreement with the management. She has served us faithfully lo these many years and has taken her share of prizes ( and a few lamp poles too, as anyone who was at Fells Point this year can tell you).